HUNDREDS of youngsters from two Devizes schools joined the fight against cancer by taking part in their own version of Race For Life. 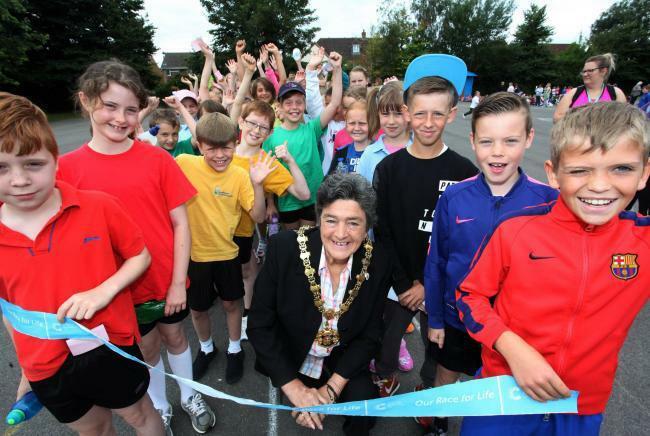 Children from both Southbroom St James Academy and Trinity Primary walked laps of a playground to raise money for Cancer Research. Around 450 pupils were at Southbroom St James on Friday to take part of the event hosted by Natalie Maddox-Hussain vice chairman of the governors of Trinity. The oldest children covered about five miles as they ran and walked ten laps of the school field. Younger children did shorter distances but all managed at least a mile. Rachel Merritt deputy head of Southbroom said: "It was a lovely day and we were very lucky with the weather. After the Race For Life we all had a picnic on the field. It was lovely to see the children from the two schools coming together. "The week before the Year 6 children had gone for the day to Devizes School and had made some new friends from Trinity. It was great to see them holding hands and encouraging each other around the field." Andrew Wilson, head teacher at Trinity CE Primary Academy said: "The whole school is supported the event and it was a real team effort and a great day out for parents, pupils and staff, all whilst raising money for a seriously good cause. It is not yet known how much money has been raised.